Transform chronic pain to a more manageable level of comfort, by regularly listening to this Hypnosis CD for chronic pain. Pain is a signal from a part of the body that is in trouble. 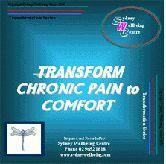 Pain is transmitted to notify the brain of a problem; so that action can be taken to correct it. Pain can manifest itself from stress, illness, infection or injury. Chronic pain can lead to depression, alcoholism, drug abuse and dependency on medication; these mask pain but do not correct the underlying problem. Have you ever noticed that a recurring pain often worsens when you are under stress, upset or angry? This Hypnosis CD for chronic pain can help you calmly transform your chronic pain into more ease of movement and greater comfort. Let your body and mind find a level of comfort that is appropriate for your lifestyle.